The street sign commemorates Jackson Heights as the birthplace of Scrabble. 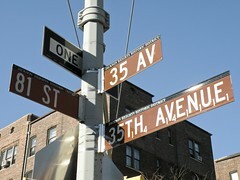 This sign marks the intersection of 35th Avenue and 81st Street, near where a former architect named Alfred Mosher Butts devised the crisscrossing word game in 1938. The original sign was installed in 1995 outside of the Community United Methodist Church where the architect invented and perfected the game, Scrabble. Mysteriously, the sign was taken down in 2008. 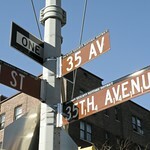 After introducing legislation to approve its reinstallation on the southeast corner of 81st Street and 35th Avenue, the Department of Transportation authorized the creation of a street sign that spells out 35th Avenue with each letter assigned a point value as in the game.